As I mentioned yesterday, the conference I was attending was definitely better suited for media people. I was able to learn some things and found several things interesting, but this was the conference's first year and it showed. Many of the speakers were the owners of companies and instead of talking about trends and best practices, a lot of the talks centered around what their company did and turned in sales pitches. Lame. At least I got to start my morning off with a donut and chai latte (with espresso) from Dunkin Donuts. Again, yesterday, we knocked off for lunch and headed into Central Park. Travis, Laura, Ariel and I ended up eating heavy appetizers at The Boat House in Central Park right next to The Lake. While eating we watched turtles sun bathe and people rowing around in rented boats. After lunch, we walked through Strawberry Fields and checked out the memorial for John Lennon. From there it was back to the conference to wait out the remainder of the speakers. After the conference was over, Arial and I set out on a walking journey to the Art Gallery District. Not far into our trip, we stopped at Bar 12 Bar (I THINK that was the name, I can't find it online) for some happy hour drinks – you don't pass up $3 beers in NY. We made it to our destination, but didn't really see any galleries, so we continued on to Chelsea. We found another spot with happy hour drinks, Calidad Latina, and stopped there for a couple of margaritas. 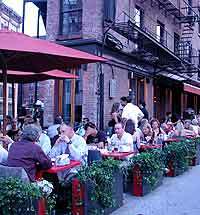 Then it was to the Meatpacking District and dinner at Vento, a cool italian restaurant. We had a new waiter and ended up scoring some free drinks due to a slight mix-up. Not much else happened on Friday. A lot of walking and exploring. I didn't know you were in NY. :) I guess I forgot to ask where you were going. Your cat's doing fine. I assume so, anyway. I've never actually seen her, just see cat food disappearing and cat poo appearing. Sorry Ariel, I fixed it. At least I was batting .500.